If you’re that kind of Minecraft player who wants to get more realistic textures in your favorite game, this Super Textile Resource Pack is perfect for you because by using this pack your Minecraft World will completely change in a new world where everything is very realistic that looks pretty similar to the real life. Despite of the resolution size of this mod, it is just 16x, you will be really amazed about how well developed this pack is. This Resource Pack will improve the look of everything starting from the texture to the details of some texture or simplifying the others. 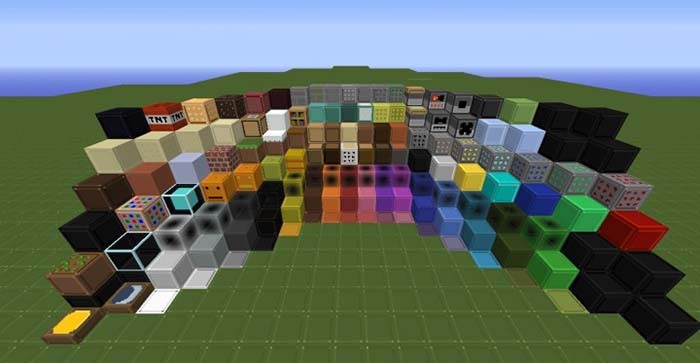 By using this pack your will notice any changes when you craft any item, for example if you will create a jukebox you will be surprised about how cool it looks, it is in lively colors and looks like a Rubik’s cube. If you love to mine you will be disappointed that the ore’s texture didn’t change, but once you’re mining in the dark they will be impossible to identify which of ore is due to the new colors and lack of light so you must have some light source while you’re mining. This Super Textile Resource Pack is a simple pack that will bring the realism inside of your Minecraft World. You can easily install and use this Resource Pack because you don’t need a powerful computer that requires a lot of power like the others packs. You can try this pack and you will be not disappointed about its changes. Start the game and choose the pack!